Edited by Antonello Frongia, William Guerrieri. One of the most influential photographers of our time, Stephen Shore has often been categorized as one of a group of artists of the 1970s who captured American popular culture in straightforward, unglamorous color images. While this is true, it is only part of the story: Shore has worked with many forms of photography, switching from cheap automatic cameras to large format in the 1970s, pioneering the use of color film before returning to black and white in the 1990s, and, in the 2000s, taking up the opportunities offered by digital photography, digital printing and social media. Published to accompany the first comprehensive survey of Stephen Shore’s work in the US, this catalog reflects the full range of his contribution, including the gelatin silver prints he made as a teenager (and sold to The Museum of Modern Art); his photographs of the scene at Andy Warhol’s Factory, in New York; the color images he made during cross-country road trips in the 1970s; his recent explorations of Israel, the West Bank and Ukraine; and his current work on digital platforms, including Instagram. This book offers a fresh, kaleidoscopic vision of the artist’s extensive career, presenting more than 400 reproductions arranged in a thematic framework, each grouping accompanied by a short but wide-ranging essay. This unique encyclopedia-style format makes visible the artist’s versatility of technique and the diversity of his output, reflecting his singular vision and uncompromising pursuit of photography’s possibilities. Stephen Shore (born 1947) was the first living photographer to have a solo show at the Metropolitan Museum of Art in New York since Alfred Stieglitz (40 years earlier). He has also had solo shows at The Museum of Modern Art, New York; George Eastman House, Rochester; Kunsthalle, Dusseldorf; Hammer Museum, Los Angeles; Jeu de Paume, Paris; and the Art Institute of Chicago. Since 1982 he has been the director of the Photography Program at Bard College, New York, where he is the Susan Weber Professor in the Arts. Hardcover, 10.5 x 9 in. / 336 pgs / 450 color. Text by Stephan Schmidt-Wulffen. Interview by Lynne Tillman. Originally published in 1982, Stephen Shore's legendary Uncommon Places has influenced more than a generation of photographers. Shore was among the first artists to take color beyond the domain of advertising and fashion photography, and his large-format color work on the American vernacular landscape inaugurated a vital photographic tradition. Uncommon Places: The Complete Works, published by Aperture in 2005, presented a definitive collection of the landmark series, and in the span of a decade has become a contemporary classic. Now, for this lushly produced reissue, the artist has added nearly 20 rediscovered images and a statement explaining what it means to expand a classic series. Like Robert Frank and Walker Evans before him, Shore discovered a hitherto unarticulated vision of America via highway and camera. Approaching his subjects with cool objectivity, Shore retains precise systems of gestures in composition and light through which a hotel bedroom or a building on a side street assumes both an archetypal aura and an ambiguously personal importance. An essay by critic and curator Stephan Schmidt-Wulffen and a conversation with Shore by writer Lynne Tillman examine his methodology and elucidate his roots in Pop and Conceptual art. The texts are illustrated with reproductions from Shore's earlier series American Surfaces and Amarillo: Tall in Texas. At age 14 Stephen Shore (born 1947) had his work purchased by Edward Steichen for The Museum of Modern Art, New York. At 17 Shore was a regular at Andy Warhol's Factory, producing an important photographic document of the scene, and in 1971 at the age of 23 he became the first living photographer since Alfred Stieglitz 40 years earlier to have a one-man show at the Met. He has had numerous one-man shows, among others at The Museum of Modern Art, New York; George Eastman House, Rochester; Hammer Museum, Los Angeles; and The Art Institute of Chicago. Since 1982 he has been Director of the Photography Program at Bard College, Annandale-on-Hudson, New York. Hardcover, 12.75 x 10.25 in. / 208 pgs / 176 color. American photographer Stephen Shore (born 1947) is a leading representative of the New Color Photography movement in the United States. From the early 1970s onwards, Shore made several road trips across the country documenting life in America with an apparent banality that provoked much controversy among his contemporaries. Stephen Shore: New Color Photography is the first and only documentary on this iconic giant of contemporary photography. Accompanying Shore over a two-year period, Goertz watched and filmed as the photographer installed his shows in Dublin and Dusseldorf and taught his class at Bard College. The 50-minute widescreen film offers an inside view into Shore's understanding of photography. DVD (PAL), 5 x 7.5 in. Text by Marta Dahó, Sandra S. Phillips, Horacio Fernández. Interview by David Campany. 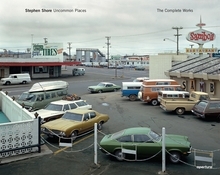 Stephen Shore has had a significant influence on multiple generations of artists and photographers. Even for the youngest photographers working today, his work remains an ongoing and indisputable reference point. Stephen Shore: Survey includes over 250 images that span Shore's impressive and productive career. The images range from 1969 to 2013, with series such as Early Works, Amarillo, New York City, American Surfaces and Uncommon Places, among others. Stephen Shore: Survey elucidates Shore's contributions, as well as the historiographical interpretations of his work that have influenced photographic culture over the past four decades. 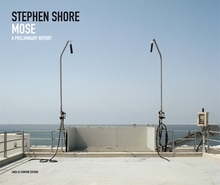 The narrative of the catalogue is conceptualized around three particularly revealing aspects of Shore's work, including his analysis of photographic and visual language, his topographical approach to the contemporary landscape and his significant use of color within a photographic context. The images are accompanied by an interview between David Campany and Shore, as well as texts by Sandra S. Phillips, Marta Dahó and Horacio Fernández. Published for his first ever retrospective exhibition, this essential catalogue also features a complete bibliography and chronology. 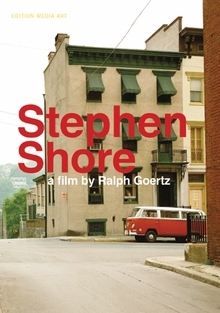 Stephen Shore (born 1947) had his work purchased by Edward Steichen for The Museum of Modern Art, New York, at age 14. At 17, Shore was a regular at Andy Warhol's Factory, producing an important photographic document of the scene, and in 1971, at the age of 24, he became the first living photographer since Alfred Stieglitz to have a solo show at the Metropolitan Museum of Art. He has had numerous one-man shows, including those at The Museum of Modern Art, New York; George Eastman House, Rochester, New York; the Hammer Museum, Los Angeles; and the Art Institute of Chicago. Since 1982, he has been director of the photography program at Bard College, Annandale-on-Hudson, New York, where he is the Susan Weber Professor in the Arts. Hardcover, 11.75 x 9.5 in. / 300 pgs / 250 color. Published by Blind Spot Series. Edited by Dana Faconti. Text by Laurie Dahlberg. 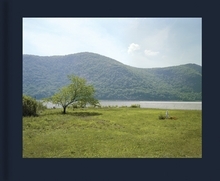 The first of Blind Spot’s Series books, this exquisitely produced clothbound artist’s book with tipped-on cover image collects 34 color photographs of New York’s Hudson Valley by the pioneering American art photographer Stephen Shore (born 1947). Shore, one of America’s most important living photographers, is celebrated, alongside William Eggleston, for elevating color photography from a medium associated with family snapshots to a genre equivalent to black-and-white photography. 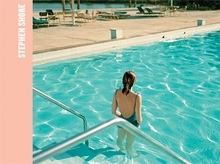 First published in 2011, this deluxe volume, printed by Meridian--widely considered America’s greatest photobook printer--was named one of Photoeye’s Best Books of the Year by critic Gerry Badger, who writes, “Stephen Shore is the master of the ‘quiet’ photograph, images which paradoxically speak more than most. These images of the Hudson Valley are quietly and utterly satisfying.” This highly collectible volume is available in limited quantities. Clth, 11.75 x 9.75 in. / 48 pgs / 34 color / Ltd Ed of 1000 copies. 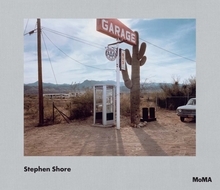 Mose collects Stephen Shore's photographs of Venice, Italy taken in 2008. Focusing on the city's floods and the construction of the mobile gates intended to protect the Venetian lagoon, it unites Shore's landscape photographs with newspaper articles, historical maps, technical reports and engineering plans. Paperback, 9.75 x 11.75 in. / 72 pgs / 57 color. Essays by Gerald Van der Kemp and Daniel Wildenstein. Introduction by John Rewald. Claude Monet found inspiration in the rose-covered trellises, wild rambles of nasturtiums, and idle drift of water lilies in the gardens of Giverny outside Paris. 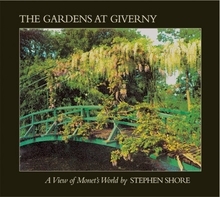 So too did Stephen Shore, who photographed the gardens one hundred years later after their painstaking restoration. Commissioned by The Metropolitan Museum of Art to photograph the renascence of the gardens, Shore visited Giverny over six years beginning in 1977. Going to the gardens before dawn and leaving after dusk, in different seasons, he came to know them in all the moods and textures that inspired Monet. Shore's fidelity to the gardens' plenitude and his desire to present the abstract beauty of nature result in exquisitely serene photographs that express the essence of Giverny. Hardcover, 11.25 x 10.5 in. / 72 pgs / 41 reproductions throughout. Essay by Stephan Schmidt-Wulffen. Interview by Lynne Tillman. Published by Aperture in 1982 and long unavailable, Stephen Shore's legendary Uncommon Places has influenced a generation of photographers. Among the first artists to take color beyond advertising and fashion photography, Shore's large-format color work on the American vernacular landscape stands at the root of what has become a vital photographic tradition. Uncommon Places: The Complete Works presents a definitive collection of the original series, much of it never before published or exhibited. Like Robert Frank and Walker Evans before him, Shore discovered a hitherto unarticulated version of America via highway and camera. Approaching his subjects with cool objectivity, Shore's images retain precise internal systems of gestures in composition and light through which the objects before his lens assume both an archetypal aura and an ambiguously personal importance. In contrast to Shore's signature landscapes with which Un-common Places is often associated, this expanded survey reveals equally remarkable collections of interiors and portraits. As a new generation of artists expands on the projects of the New Topographic and New Color photographers of the seventies--Thomas Struth (whose first book was titled Unconscious Places), Andreas Gursky and Catherine Opie among them--Uncommon Places: The Complete Works provides a timely opportunity to reexamine the diverse implications of Shore's project and offers a fundamental primer for the last 30 years of large-format color photography. Hardcover, 12.75 x 10.5 in. / 188 pgs / 162 color / 7 bw.